Have you been thinking about a home renovation, expansion or new construction in 2019? You aren’t alone. More than 300 Arlingtonians have used Green Home Choice to help make their homes energy efficient, healthy and comfortable. Green Home Choice is a FREE County program that helps homeowners make renovations, additions and new home construction healthier and more sustainable. Not only does the Green Home Choice certification program make your home more energy and water efficient, it also makes your home more comfortable with better indoor air quality, stormwater management, tree preservation and reduced waste. When buying a car, fuel efficiency and a comfortable ride are central considerations. Given the investment you make when renovating or building a new home, comfort and efficiency are equally important. 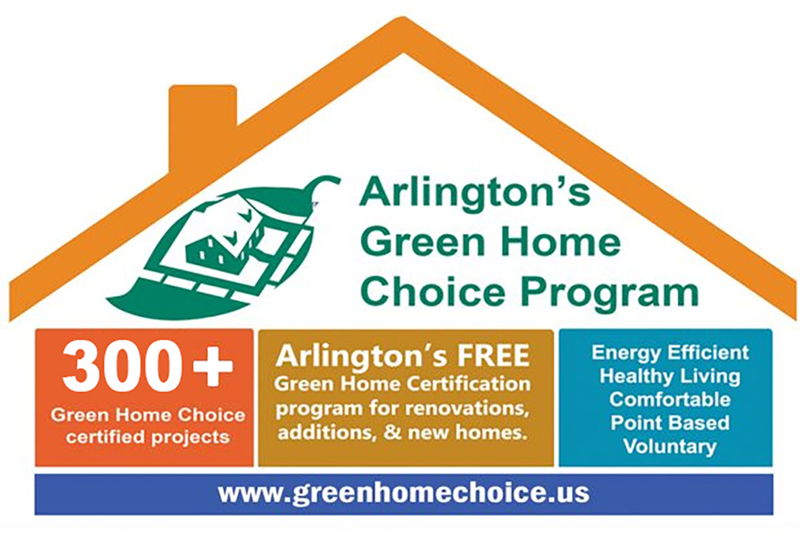 On average, a Green Home Choice home uses 50% less energy than Arlington homes of the same size and saves between $600 and $1600 per year on utility bills. Green Home Choice also helps homeowners renovate their kitchens and bathrooms in a more sustainable way and offers a certification for participation. Whether you are a homeowner, developer, architect or builder, Green Home Choice can help you rethink your next construction project to enhance the quality, value and overall sustainability of your home. For more information about the program, visit the Green Home Choice Website at www.greenhomechoice.us or contact [email protected].